It's no doubt that the seasons, as well as the holidays that come and go with them, have a big impact on my cravings. So it's probably no coincidence that I found myself craving Devil's Food cake in the past few weeks. Although, to be quite honest, I crave chocolate all the time! If I'm not having some type of chocolate dessert at the end of the day, I will eat a couple squares of chocolate at some point during the day, almost every single day. It's like an unwritten rule. I find that I'm a much happier person when I have some chocolate in me. Instead of a cake, I thought I'd make a few cupcakes and put some of my Halloween-theme cupcake decorations to use! 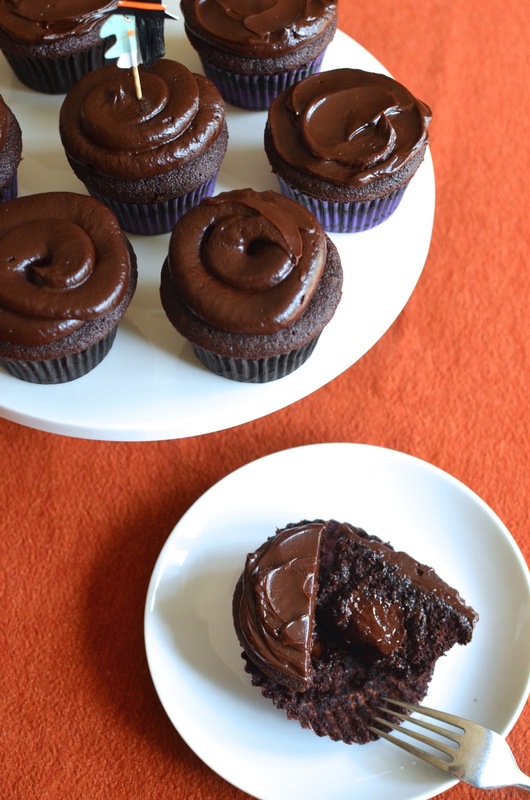 These devilishly dark chocolate cupcakes are my kind of Halloween treat. For fun and a little variety, I stuffed the cupcakes with a chocolate apricot filling before baking. I stirred melted chocolate together with a little apricot preserve and butter, let the mixture cool and stiffen enough to roll into balls, and then chilled them until time to bake. I was a little too generous with my chocolate-apricot surprises (in my greediness, I made the chocolate rounds larger than I should have). The heavy filling mostly sank to the bottom but if you'll do as I say, not as I do, and go a little lighter on the filling, you should have more success. Regardless though, the extra chocolate from the filling melds into everything while adding moisture and the apricot flavor, while not very distinct, provides a little note of fruitiness in the background that's quite nice. The cupcakes themselves are so moist and just heavenly for any fellow chocoholics out there. Inspiration really is everywhere. In this case, the inspiration for the filling came specifically from a recipe, which originally involved red velvet cupcakes, that I found in a book - a cozy, culinary-themed mystery book to be exact. You probably know the type of book I'm talking about - the kind that often have corny titles and silly covers. They may seem silly at first glance but I have to admit I'm a fan of many of them and judging by the proliferation of these types of mystery books, I'd say there are many people who enjoy them like I do. Life is serious enough as it is and, sometimes, I just don't want anything too "heavy" and I totally welcome a reprieve in the form of some light, entertaining, good reads. The other thing I was also channeling with these cupcakes is America's Test Kitchen's ultimate chocolate cupcake recipe, which is a full-on chocolate cupcake with chocolate frosting that includes a round of chocolate ganache placed in the cupcake batter right before baking. It sounds like chocolate heaven and I wonder why I've yet to make that exact recipe! And lastly...these cupcakes had me thinking of Italian tri-color (or rainbow) cookies - something we love dearly at my house - which have apricot and chocolate elements to them. I hope you have a fun and safe Halloween! Remember to devour some devilishly good treats, all the better if it involves some good dark chocolate. For the cupcake batter, I used David Lebovitz's Devil's Food cake recipe. As many of you would agree with me, a David Lebovitz recipe is a pretty sure bet and these cupcakes, like the cake, are moist and flavorful, delivering just what you're looking for. I divided the cake recipe in half, making a small batch of 8 cupcakes. For the chocolate-apricot "surprise" that I tucked into these cupcakes, I combined 2 ounces of chopped semisweet chocolate together with 2 teaspoons, each, of apricot preserve and butter. Use the clear portion of the preserve, without any big chunks. Simply heat the mixture in the microwave until the chocolate is just melted. Then stir until smooth (there will still be some bits from the preserve). I let the mixture cool and thicken until firm enough to scoop into round ganache-like balls. You can pop the mixture in the refrigerator for 10-15 minutes to speed up the process but keep an eye on it since it will harden pretty quickly. If you take the filling and divide them into 8 balls (about generous teaspoon rounds), it should be just the right amount to stuff into the cupcakes. I was greedy and made 6 larger chocolate balls and I think that was too much. Place your chocolate rounds on a wax paper lined plate and store it in the refrigerator until ready to use. I did this the night before. Fill the cupcakes about 2/3 of the way before tucking in one of the chocolate surprises. Take a bit more batter and smooth it over the chocolate filling to fully cover it. Bake the cupcakes in a 350 degree oven until they have risen and the tops are set and dry, springing back lightly to the touch. You can also insert a cake tester around the cupcakes, keeping in mind the center will be wet from the filling. They should take about 22 to 25 minutes. The frosting is a butter based chocolate ganache (butter instead of cream). It's meltingly soft and smooth. I started off piping the filling using a plain round tip then switched over to my offset spatula when it looked like I was running short. I've never been proficient at cupcake decorating, which is all the more reason why I love ganache. It seems to dress itself and all you really need to do is slap it on...and let me eat it! Make filling: Place ingredients in a microwave-safe bowl and heat for 20 seconds on high. Stir, and if necessary, place it back in the microwave in 5-second increments until mixture is just melted and relatively smooth (there may be some coarse bits from the apricot). Let cool until set enough to roll into balls. You can place the mixture in the refrigerator but keep an eye on it since it should harden enough to roll within 15 minutes. Using a teaspoon measure, scoop out the mixture and roll into 8 balls. Place onto wax paper and store in the refrigerator until ready to use. Make cupcakes: Preheat oven to 350 degrees and adjust oven rack to the middle position. Line 8 cups of a regular muffin tin with paper liners. Sift the cocoa powder, cake flour, salt, baking soda, and baking powder together into a bowl. In the bowl of a stand mixer, beat butter and sugar together for 3-4 minutes until smooth and creamy. Add egg and mix until incorporated. Scrape down the sides and bottom of the mixer as needed to make sure everything is evenly mixed together. Mix the coffee and milk together in a measuring cup. Stir half the dry ingredients into the butter mixture, then add the coffee and milk. Lastly, stir in the remaining dry mixture until just incorporated. Fill each cupcake liner with batter about 2/3 of the way full. Place one of the chocolate-apricot mounds into the center of each cupcake, pressing down slightly. Take a bit more of the batter and place it over each to make sure the filling is fully covered. The cupcake liners will be about 3/4 way full. Bake until cupcakes have risen and set on top (a toothpick inserted into the sides of the cupcakes should come out clean, bearing in mind the chocolate centers), about 22-25 minutes. Let cupcakes cool for 5-10 minutes in the pans, then gently remove from the pan and let cool completely on a wire rack. Make frosting: Melt chocolate, instant espresso powder (if using), and water in a heatproof bowl set over a pan of barely simmering water. Stir until just melted, then remove the bowl from the heat. Whisk in the pieces of butter, a few at a time, until completely melted and the ganache is smooth. Let ganache cool at room temperature or in the refrigerator (keep an eye on it since it could harden too much to spread) until just thick enough to spread. Frost each cupcake using an offset spatula, or place frosting into a piping bag fitted with a plain or star tip to pipe on top. Whoa! I love, love, love this -->chocolate apricot filling. I've never heard of that before, but it made my mouth water! And, I would've done exactly as you did - I would've overfilled the cupcakes. We love food like that. You and me sistah? The same! :-) Pinned! These are too cute! And that filling sounds so great! Yeah - more chocolate works, right? Thanks, Marie. These cupcakes are so cute Monica...perfect for the Halloween...I love the idea of a little fruity filling. with chocolate. I like 'cute' as opposed to overly spooky for Halloween. Thanks, Juliana. These devil's food cupcakes look wickedly delicious.. words cannot describe how badly I am craving one to devour right now. Great recipe, you definitely have got me hungry! I really really need one of these now. They look out of the world. An apricot filling sounds like a nice little surprise hiding inside a luscious chocolatey cupcake. LOVE them! I hear you! These went down easy - too easy. The filling just made it more moist and chocolaty...I'm so glad you like 'em! I like your chocolate every day mentality...and should probably adapt it into my life! These cupcakes sound awesome. So deep and dark and lovely with the apricot filling. Plus your Halloween decorations are adorable! I love the surprise! These chocolate cupcakes look rich and divine! Glad you like them, Angie. haha - thank you, Kelly! I am such a big chocoholic, no joke. : ) I'm glad you like them. Halloween was a fun excuse to make these but I make chocolate cakes all the time regardless. You have a fun one on Friday! Hi my name is Tricia and I'm a chocolaholic! It's always nice to know we are not alone :) These look like they could cure my daily chocolate craving and so cute dressed up for Halloween. They look moist and creamy and wonderful! Love these and the filling! I am such a happier person when I have chocolate in me!! These cupcakes look so rich and chocolatey and delicious! Love them! I'm glad you can relate! : ) Thanks, Cate. What a great idea for cupcakes!! Now I'm craving chocolate! These are my kind of Halloween treats too! Love that chocolate apricot filling - so different than what I normally make! These cupcakes are just decadent!! Love the apricot!! How freaking pretty cupcakes! Love the apricot surprise in them! haha - love that! Thanks, Bal. These sound and look delicious! Love the little surprise in the cupcake too! Really want one! Glad you like them, Asmita! I wish I could trade you for a few of your amazing cookies! Thanks! Hope you had a fun Halloween, too. haha - thank you - those were all the "D's" I was aiming for! Agreed! chocolate makes a very happy Monica (: The witch toppers are super cute! And wow, the chocolate apricot surprise sounds so good. I'm bookmarking this recipe! haha - yes! : ) The toppers were my kind of 'decoration'...super easy! These cupcakes look delightful! The chocolate surprise is such a great idea! Just to think about it makes me want one. So glad you like the idea. Thank you!